Pyongyang’s decision to restart the reactor at Yongbyon isn’t a surprise. North Korea’s Atomic Energy Institute told Japan’s Kyodo news agency that it had resumed operations at Yongbyon. The confirmation came a day after Pyongyang threatened additional missile launches and just days after Korean Liberation Day, commemorated by both North and South Korea. 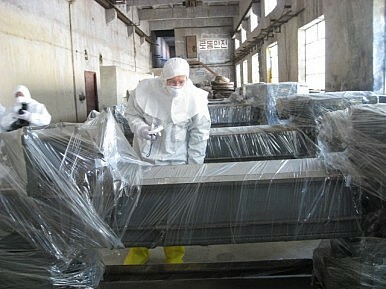 “We have reprocessed spent nuclear fuel rods removed from a graphite-moderated reactor,” the Institute told Kyodo. It added that highly enriched uranium for nuclear weapons and power was being produced “as scheduled.” The Institute did not clarify what quantities of plutonium or uranium was producing. Observers of North Korea’s nuclear program had long expected Pyongyang to eventually resume operations at Yongbyon. While the development, if true, wouldn’t be surprising, it nevertheless indicates Pyongyang’s refusal to ramp down progress on its nuclear program. Plutonium production at Yongbyon would steadily allow North Korea to expand its arsenal of compact nuclear devices. Earlier this year, James Clapper, the U.S. director of national intelligence, testified that Pyongyang would being reprocessing activities at Yongbyon soon. An assessment by experts from the U.S.-Korea Institute at Johns Hopkins University and the National Defense University released last year outlines several scenarios for nuclear stockpile growth in North Korea, most hinging on the country’s ability to steadily use Yongbyon and other facilities to generate plutonium and possibly uranium. Yongbyon had been shut down following the Six-Party Talks between North Korea, South Korea, the United States, China, Russia, and Japan on nuclearization on the Korean peninsula. In early 2013, following its third nuclear test, North Korea vowed to restart the five megawatt reactor. So far in 2016, North Korea has tested a nuclear device, launched a satellite, shown off a compact nuclear device, and repeatedly tested road-mobile and submarine-launched ballistic missiles. Kim Jong-un, the North Korean leader, has vowed to push ahead with North Korea’s nuclear weapons program while pursuing development at the same time.